Myspace is a popular social networking site that allows its user to create a profile page so that you can meet and connect with your friends and family and fans. It is popular among the artist where they can share their original creation. You can use your Myspace profile like a blog customizing how it looks by modifying HTML and CSS codes in Myspace editor. It allows you to create your blog post, share music and videos and design your presence on the internet. Myspace, once the giant social networking site lost a significant number of users after the launch of today’s generation social media giant Facebook. 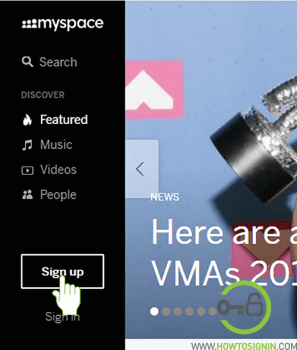 How to create a Myspace account? To use Myspace you need to create a new account. It requires a valid email address and some necessary information to register for Myspace account. You can also use your social account for Myspace signup. It’s free to sign up for a new account. You can use any web browser for Myspace Sign up on PC or MacOS X. Myspace no longer supports app in Android and iOS store. So to create a new account, you need to use web browser available on your mobile device. Follow the steps below to create your new account quickly and without wasting a single penny. Visit myspace.com from web-browser. You’ll reach the homepage of Myspace. On the homepage, you will see the navigation bar on the left side of the screen. On the menu bar, click on Sign up. 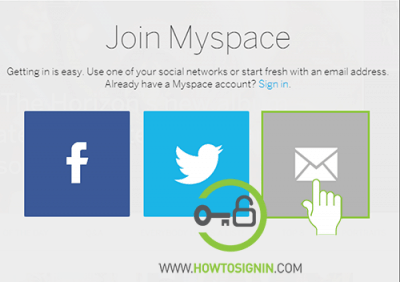 You can register Myspace account in two way: using your social profile or using your existing email address. 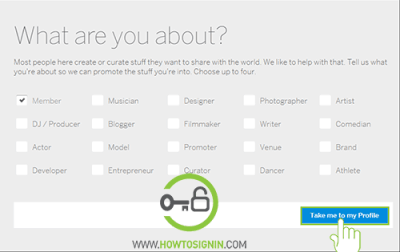 To sign up using your social account, click on the respective social icon and navigate to the login process. For email sign up, click on the email icon. 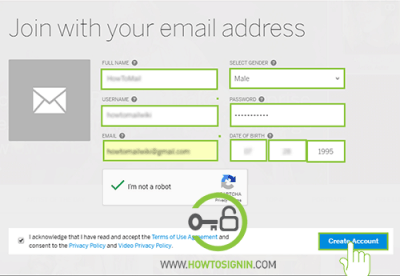 If you choose to sign up using email, you have to enter some basic information about yourself. Enter your full name. Enter your real name so that your followers, friends, and family can identify you with your name. Choose a username for your new account. Try to use a simple username as this can be helpful for others to land on your profile or search you directly. Enter a strong password for your account. Choose the password carefully; it should be easier for you to remember but hard for others to presume. Select your full date of birth. Solve the captcha clicking on the captcha box and after you enter all the information hit Create Account. If you are any of the specific professional, choose from the list given, otherwise choose Member option. Finally, click on Take me to my Profile to complete Myspace sign up process. Now you can start sharing your thoughts, original music and video creation, photographs and much more stuff with your followers, friends, and family.